Growing up in south-west Wales, just east of Pembrokeshire, in ‘the sleepy town of Laugharne’, I was always restless. Playing in the woods may seem idyllic ... until it rains and living a stone’s throw from a plethora of beaches might sound like paradise ... until the 17-year old you swallows a little too much sea water mid surf. But after living away from the area for the best part of two years, I started to yearn for salt air and open space - indeed, the fact that I no longer have that pair of shoes sitting in their permanently mud-topped-with-sand state in the utility room made me realise that something was missing. Home was calling. And so, craving the salt and the sea, I booked my ticket and set out on a jaunt along the Pembrokeshire Coast Path. After an evening catch up with my parents (duty calls), I headed to Amroth, a small water-side village and the south-eastern starting point of the trail. I arrived at 6 a.m. to overcast skies, the pebbled beach only a few shades lighter than the charcoal clouds and olive green sea. Spying one couple taking a morning stroll through the village, I felt emboldened and set off upon confidence-boosting terrain. It didn’t take long for the world to wake around me - within a mile I was meeting walkers from the opposite direction, exchanging 'good mornings' and being sniffed around the ankles by their dogs (for the right reasons I hope). Eventually I reached Saundersfoot with its bustling harbour and quiet beaches. It was here that the wind picked up, carrying the salt that I love. Continuing through woodland full of wild garlic and pine tree, I took a moment to savour these earthy scents. Turning the corner and reaching sea level, my next destination revealed itself. Tenby’s charm is in its cobbled roads, dainty cafes and community spirit - but it's Tenby Harbour that I found most beautiful. Quite possibly one of Europe’s best beaches, it is surrounded colourful terraces (one of which has featured on Grand Designs) and boasts a lifeboat station that stretches out into the sea. I chose to pause here, put my camera to good use, and indulge in some breakfast at The Mooring on High Street. Tenby felt perfectly secluded and my second day of walking was filled with equally peaceful finds. Having made my way as far as Barafundel Bay, I spied families picnicking on the grass and sand while admiring the time-and-water-worn cliffs. Continuing up into the hills, greenery took over as the path disappeared into the forest, taking in lily ponds and lakes. A few miles on I stumbled upon (and might well have missed if I wasn’t in the know) St Govan’s Chapel. This curious, heartwarming piece of architecture was carved from the cliffs in the 12th century and the view of the sea through its window is absolutely awe-inspiring. The site was deserted when I arrived so I stayed to watch the sun descend, the waves crashing below while gulls socialised above. I can see why people would carve through a cliff to make such a place and thank them, 900 years on, for their efforts. Diverting from the coast slightly I came upon St David’s Cathedral, located within the UKs smallest city, which bears the same name. The cathedral honours the patron saint of Wales while the city offers cafes and views aplenty. Nearby is Abereiddy Beach, the penultimate destination on my journey - the final stop being the creative town of Cardigan where I celebrated the end of my hike with a meal at Pizza Tipi. 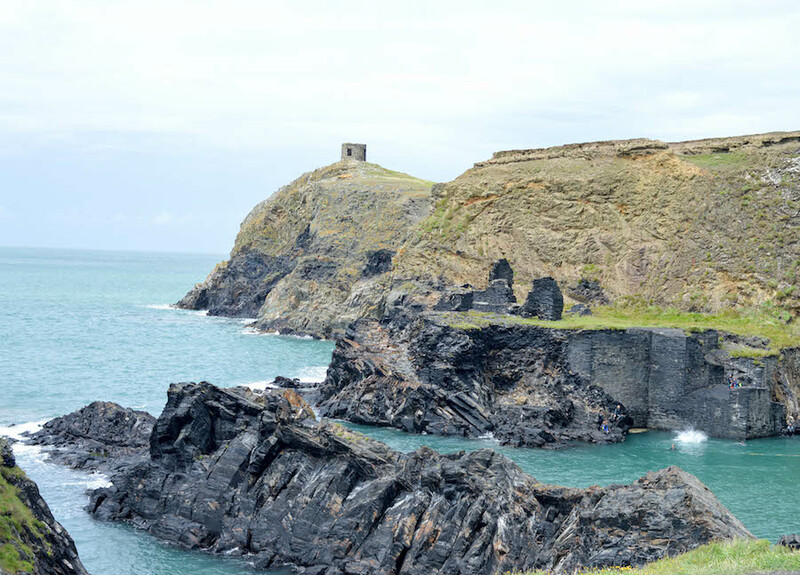 Abereiddy Beach and its ‘blue lagoon’ are hotspots for those with a penchant for extreme sports. Red Bull hosted a cliff diving event recently and the site is always full of hobbyists kayaking, surfing, swimming and cliff diving the hours away. I realised here that this area is frequented by people who have chosen tranquility over city madness. Everyone I encountered was kind, caring and humble, and clearly in love with their little corner of the world. And so they should be. You can see more of Rhys' work here.